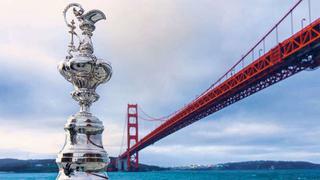 Eight sailing superyachts are confirmed to compete in the first-ever America's Cup Superyacht Regatta, beginning in a few short days in San Francisco Bay, running over the three America’s Cup Finals lay days on 9, 11 and 13 September 2013. While the America's Cup AC72 high-flying sailing machines are set to take over San Francisco Bay starting Saturday 7 September, the America's Cup Superyacht Regatta promises to be a high-performance sailing event to complement the Cup show-down – this one dedicated to superyacht owners and their guests. So far eight superyachts have confirmed their participation in the regatta – and more are set to confirm in the coming days. The superyachts are to compete in two classes; those in the Racing Class include the Pendennis-built 55.5m schooner Adela, 55m Vitters-built ketch Adele and 42.37m Scarano Brothers sailing yacht, the classically styled America. Sailing superyachts competing in the Exhibition Class are the following: 79.25m Royal Huisman Athena, 30.48 CNB Chrisco, 27.5m Classen Shipyards Kealoha, Oracle Racing's USA 76, and 24.38m Dynamique Coconut. The superyacht racing is complemented by a glamorous social programme, including a welcome cocktail party at the private penthouse of superyacht owner Tom Perkins, a cocktail reception hosted by Louis Vuitton, a six-Michelin-starred Napa Valley Owners’ Dinner at Far Wiente Winery, and an end-of-regatta party, sponsored by Y.CO, that will help to raise funds for the Andrew Simpson Sailing Foundation. All of this is topped off with access to the official America’s Cup hospitality, including spectator boat viewing during the America's Cup Finals racing days. Exclusive in-venue berthing is available to superyachts, offering prime positions to watch the America's Cup Finals racing as well as being adjacent to the America's Cup Park and Pavilion. Sailing superyachts that have booked a berth for the duration of the 34th America’s Cup Final enjoy complementary invitation to compete in the Superyacht Regatta, while those who have not booked a berth can enter the the Regatta for a fee, and motor yachts in attendance can enjoy course-side views of the racing action.